I don’t need to introduce it, you hear everywhere about mindfulness. I also proposed you in March 2017 a 1-week mindfulness challenge that had been taken by a lot of people! 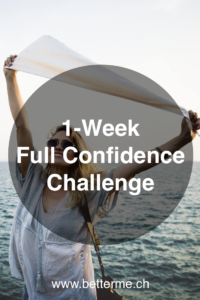 Well, I decided today to challenge you again, but this time for a week of “full confidence”! The principle is simple and inspired by my ebook “Boost Your Self-Confidence In 14 Days” (order it here if you haven’t discovered it yet 😉 ). The goal: you are going to live a week when you consciously decide to focus solely on your skills and qualities as well as those of the people around you. Easier said than done, so here’s how you can do it. You will first start by taking a piece of paper on which you’ll write 10 of your greatest qualities. This is not necessarily an easy exercise because you are often afraid to be considered a “vain” person if you promote your skills. Don’t stop until you find 10 qualities that totally match you. It can be for example: I am generous, open to discussion, kind, good in sales, etc. Once you complete your list, stick it on your front door so you can read it every day when you leave your home. Now that you’ve determined what your 10 greatest qualities are, I suggest you make a list of 5 people you’re going to be with during your week. It’s better to choose people depending on the number of interactions as well as their duration that you’ll have with them during the week. For each selected person, write next to his name 3 of his top qualities. Again, stick this list on your front door as soon as you complete it. You have determined your main qualities as well as those of the people you are going to meet this week. The challenge you are facing is the following: for a week, you will focus your attention only on your actions and words, as well as those of your loved ones, who reflect the qualities written on your two lists. Every time you notice that one of your qualities has been expressed by one of your actions or your words, put a little “tick” on your list. Do the same for the people you’re seeing during the week. I also encourage you to “provoke” the expression of these skills and qualities by asking you: “what actions can I take to use these qualities”? – Tell me, as you’re a wise man, what’s in your mind? – In my mind, there are two dogs, one black and one white. The black one is the dog of hatred, anger and pessimism. The white one is the one of love, generosity and optimism. They fight all the time. – Two dogs? Who’s fighting? – Yeah, practically all the time. – And which one wins?